Seeing the band working on a follow-up of course caused expectations to soar. I do have to admit that the first sample I heard last year – “Kingdoms”, the band’s new album, came out on the 20th September 2011 – disappointed me a little, especially the drumsound. But then I thought it wouldn’t be like that on the CD. Plus, the songs have several layers, so somewhere you have to compromise. I was of course thrilled to find the CD then sent to me to write a little text about it. There are a few new elements here: the music has more Black Metal influences now, though not everywhere. And the line-up changed: drummer Jeremy Taylor was replaced by Nick Bean, while keyboardist James McGregor also left the band. Brendon Capriotti joined as second guitarist. “Kingdoms” begins with an “Intro”, consisting of an orchestral piece featuring strings, brass and marching drums. The guitar solo that follows makes that part alone already very epic! The rest of the band (save vocals) fall in, rising steadily to a climax, while near the end of the track setting in the main composition of “Burned To Death”… which obviously connects very smoothly. Here you get a direct punch and dito attack. The pace is high and the melodic Death Metal has the aforementioned Black Metal touch. Bernard again does not choose for the clean approach of singing, but the harsh way. He is assisted by Jesse Millea, who can be heard in the bridge. The contrast is very nice and well done, meaning I like her singing. Melody is of course key in RED DESCENDING’s songs and especially the chorus here benefits from it. The speed is higher, too. The obligatory guitar solo comes in later and shows how proficient Ian and/or Brendon is/are. I don’t know who played the solo, but in any case, it shows the proficiency of the man in charge for this. At this stage the music, the atmosphere is darker, which means the vocals turned to hellish shrieks. Bass and guitar solo put an end to the song. All in all, a very commendable end result. “Inferno”, as the title indicates, takes a powerful start, not in the least due to the drums. The highest gear is then selected for the verses (Melodic Death/Black Metal) with Bernard’s typical screams. Since the Metal is a bit more Black Metallish than before, the blastbeats, guitar riffs and vocals are testimony to that. The symphonic parts are not far off, don’t worry. The following break is exactly that. The bass is then higher in the mix, providing the leading lick. And then damnation dawns… DIMMU BORGIR-style, to name one example. The whole creates a creepy impression. Jesse comes into the spotlights then, as the music rushes onwards. In the second instant it’s beauty-and-the-beast style of singing. This is definitely not a happy song. In addition, it ends in that way, atmospheric, creepy and dark. Low brass sounds and ravens contribute to this feeling. On to the “Kings Of Torture”. The main guitar melody is played first, but without the Metal power, which kicks in soon enough, laying out the dark and vicious verses. The bridge contains contrasting singing: shrieks and cleans (again by Jesse Millea). You could somehow compare it to SUIDAKRA, when Marcel Schoenen was still in that band to provide clean vocals. The chorus is where effects are put on Bernard’s shrieks and the music takes on a dramatic character. An instrumental break follows, offering nice melodies and the awaited guitar solo. The theme of the intro returns and the band steadily goes back to business as usual. In short, still heading in the right direction. So far, so very good. Which brings us what would be my favourite track on this album: “Reprieve”. It begins with midtempo melodic Metal, which in itself is good and then the pace increases, morphing into atmospheric melodic Death/Black. The fast chorus connects neatly with the verses. The whole sounds very emotional and dark. The composing is well done and even has the acoustic guitar added to it. This gives the music a refreshing touch. The guitar solo moment is, once again, a highlight, and the rhythm guitar adds to that. It ends with the melodies of the piano before the emotional power of the chorus returns. Simply breathtaking! “Infect Misery” continues the not so happy mood of the album with a melodic/symphonic intro. As the music advances, the song is being built, something will break loose. And so it happens as fast-paced Melodic Death Metal is unleashed. No birds and bees here, no plains of heavenly pleasures, only dark and miserable impressions. The high tempo is dominant, for which you can thank Nick, as he beats the (…) out of his kit. The solo, however sad, is inline with the overall feel of the song. “Through Unknown” (feat. guest vocals by Gunilla Enhörning) also starts with a symphonic intro, followed by fast, atmospheric Black Metal this time. The verses have a hymnic character, despite fast(er) outbursts, while the chorus is done a little slower. The whole sounds quite bombastic. On the melodic front, the guitar solo is again flawless, while keyboards help with dazzling injections. So far, still very good, were it not for “This Endless War”. The acoustic intro with symphonic backing is nice, no problem with that. However, and yes, it’s not only here, but it is most clear here: the drums sound very bad here, very weak. It’s less of a problem when the rest of the band plays along. The verses are melodic with a dark touch. Judging by the album cover, doom is nigh. However, the melodies sound rather Folky (to me) and again I would like to refer to SUIDAKRA for comparing. On a whole, this song is good, but just not as attractive or strong enough as the others. Winds, holyness and a violin melody occupy the intro of “The Wilderness”. Fierce midtempo melodic Death/Black Metal follows, the instrumental side being hymnic. The acoustic guitar forms a nice combo with its electric cousin. Many bands have applied this in one of more of their songs, but the name that came quickes to my mind was (yes, again, sorry) SUIDAKRA. The vocals are handled by Bernard and Jesse. Judging by the lyrics, I consider this to be a hopeful song. And I find it better than “This Endless War”. 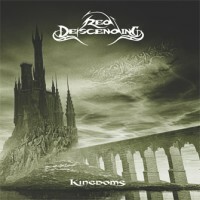 The album ends with “Kingdoms” where suspense and atmosphere are key elements to begin the song with. The music is like before and I found the verses (with soft singing) sounding similar to the music of the Austrian band SUMMONING. The singing is done in three ways: shrieks, growls and (female) cleans. All joined in a very worthwhile musical experience. While this review is way overdue – for various reasons, but it remains a mea culpa somehow – I want to say (repeat) that I found “Where Dreams Come To Die” a wonderful discovery, on which the band had set the bar quite high. As skilled as these musicians are, I found it a bit strange to see them going into a more Black Metal-ish direction. Not that I mind, for if the songs require such a change, then I fully understand it. Luckily the typical RED DESCENDING stamp is present throughout the album. My main problem, as you may already know, with “Kingdoms” is the drums. I do not question Nick’s talent, far from it even. It’s the sound, however. Sure, one has to compromise if there are many layers in the songs, but personally I think they overdid it here, especially on the kickdrums. Aside from that, on a more positive note, I am obliged to give kudos to the band for what they’ve achieved on “Kingdoms”. The material is again very solid, very cohesive, and like before recommended for anyone who likes a well-balanced (Metal vs melody) Metal album. Do give the album several spins to let it show its secrets.